As a Toronto wedding photographer I often see unique moments that I'm proud to document. Maybe because my father passed away before my marriage event, or maybe because I'm also parents I am particularly attracted by moments between the parents and their children. During this wedding at Kortright Centre, I noticed the special closeness of the two families. 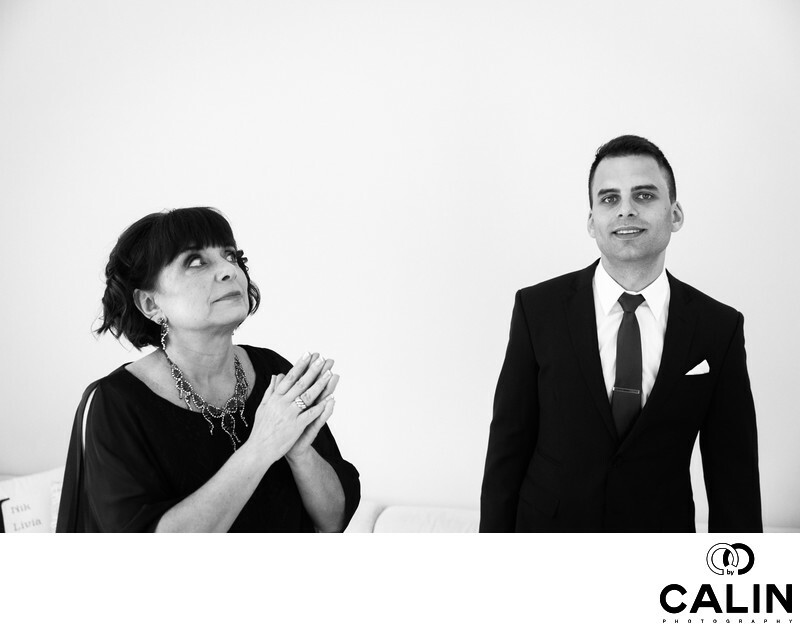 During the groom preparation for his outdoor ceremony at Kortright Centre his mom and father came to help him get dressed. The best wedding photographers know that this is a golden opportunity for an artist to take some great photographs. As such, I position myself in a good spot, set the exposure and check my composition, then waited for something to happen. My patience was rewarded because the mother and the groom behave as if I wasn't even there. Soon they started making jokes and I was able to take a few frames unobserved. The image features the mother of the groom holding her hands together in a prayer and looking towards her left at the groom. While I don't remember what was said in that particular moment when I capture this candid photograph, this image evokes mixed emotions. On the one hand, I like the fact the mom is praying. On the other hand, I find the way she looks at her son funny. From a composition perspective the images dynamic as the subjects are placed parallel to the baroque diagonal. This particular technique gives images a sense of movement. The mother's eyes create a visual leading lines towards this second subject of the photograph, the groom. The groom is in the camera, engaging the viewer of the photograph in a perfect triangle. While photojournalism is not necessarily about perfect composition, marrying beautiful moments, composition and good lighting is a great recipe for success. The couple and the family absolutely cherished this photograph and included it in their wedding album. In post processing I have a lot to do so to enhance the photojournalistic feel of this image, I converted it into black and white. I have to admit I absolutely adore black and white imagery. I often take my time during the dinner and throughout the event to capture images that I know will be perfect candidates for black and white photographs. When the light is harsh or the quality of light is poor, often converting the images into black and white makes a huge difference. Also, I like observing people having fun getting their pictures taken in the photo booth. I snap a few images of their reactions and those look amazing in black and white. The bride and groom selected this particular locationfor a few good reasons. First, it is located in the northern part of the greater Toronto area very close to Highway 404 and Highway 401, as well as several hotels. Second, the establishment is a non-profit organization that uses only renewable energy and employs sustainable technologies to power its operations. Third, all proceeds will go to environmental education programs. Most importantly, the area offers splendid backdrops for wedding photography. Among them Maple and Pine trees forests, trails and way more. You can rest assured that throughout your event your guests and family will be well entertained here. The location is well known for the Sugarbush Maple Syrup Festival that takes place every year between March and April. Also, Torontonians enjoy doing cross-country skiing along the forest trails of the region.